In my last article about troubleshooting SharePoint solutions with CloudShare, I introduced some of the services, tools and techniques available when attempting to identify issues & problems found in a SharePoint farm. One powerful Microsoft tool for this purpose is SharePoint Diagnostics Studio 3.0 (SPDiag 3.0), included in the SharePoint Administration Toolkit 2.0. 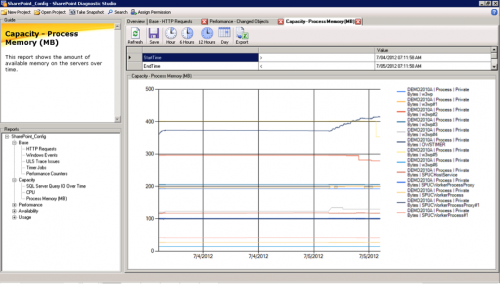 In this article, I will show you how to use SPDiag 3.0 to monitor SharePoint Solutions. Security Configuration Wizard (SCW) manifest- this tool reduces attack by adding roles for SharePoint 2010 to Windows Server 2008 SP 2 / Windows Server 2008 R2. This reduction is accomplished by following security best practices. Load Testing Toolkit (LTK)- generates Visual Studio Team System (VSTS) tests based on SharePoint 2010 IIS logs. User Profile Replication Engine 2010 (UPRE 2010) – provides the ability to replicate user profiles and social data between User Profile service applications in SharePoint 2010 (not supported in SharePoint Foundation 2010). 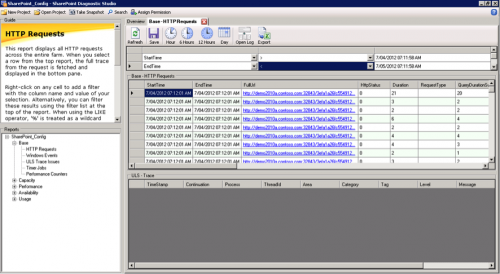 Content Management Interoperability Services (CMIS) – connector for SharePoint Server 2010. The purpose of this connector is to enable SharePoint users to interact with content stored in any other repository implementing the CMIS standard. SPDiag 3.0 – provides a unified interface to gather relevant information from a farm through rich data visualizations. SPDiag 3.0 simplifies the process of troubleshooting a SharePoint 2010 deployment by providing a unified view of collected data and reports on performance issues. This information can be shared or exported so you may do a deep analysis of detected problems and simplify the process of finding solutions. Once you have installed and configured SPDiag 3.0, either in your SharePoint farms or in your local computer, you can start to monitor your deployment (Note: If you want to use it from a local PC to troubleshoot a remote SharePoint 2010 farm you’ll need to enable remote PowerShell management on both sides, remote servers and local PC, and also install .NET Framework 3.5 and .NET Chart Controls for .NET Framework 3.5 in the local PC). Run SPDiag 3.0 (Start -> All Programs -> SharePoint 2010 Administration Toolkit -> SharePoint Diagnostic Studio) and create a new project through the menu option available in the SPDiag 3.0 landing window. 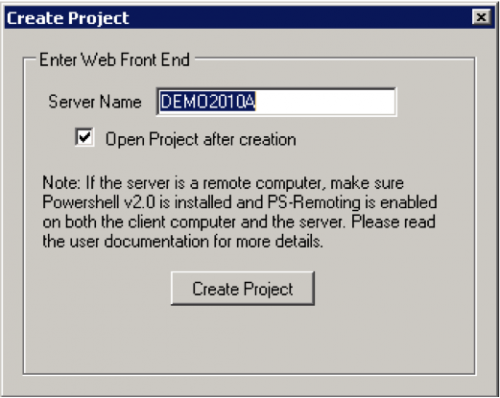 You have to specify the name of your SharePoint 2010 server and click the “Create Project” button in the “Create Project” window. Once the project is created, an overview window will be displayed the availability of the SharePoint 2010 farm and its performance. 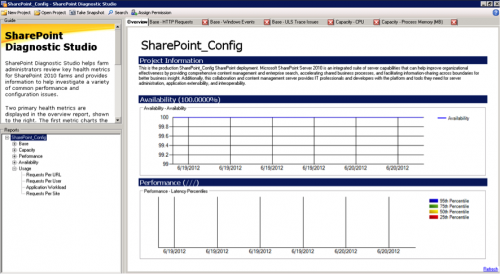 This information is displayed in two charts and it’s based on information living on the SharePoint_Config database. The “Reports” area provides a shortcut to different reports categories. For each report category and each individual report, there is a related description in the “Guide” area of the SPDiag 3.0. For instance, “Base” category allows you to view information about HTTP Requests and ULS – Trace. 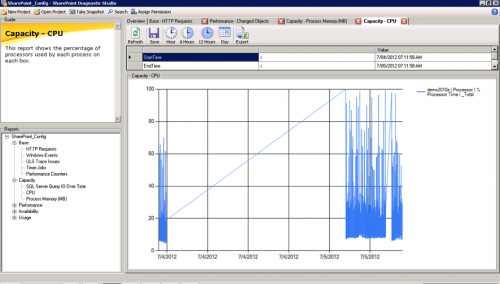 “Capacity” reports display information about performance in terms of SQL Server operations, CPU usage or RAM memory consumed by SharePoint processes. All this information is shown in really cool charts built on top of .NET Chart controls. Finally, SPDiag 3.0 allows you to create snapshots in order to compare collected data in different timeframes. That’s troubleshooting SharePoint Solutions with SPDiag 3.0 and CloudShare. Happy CloudSharing!